scans_daily | U.S.Avengers #5-6: "Meet the New Boss"
U.S.Avengers #5-6: "Meet the New Boss"
"He's smart that one, smarter than he lets on. 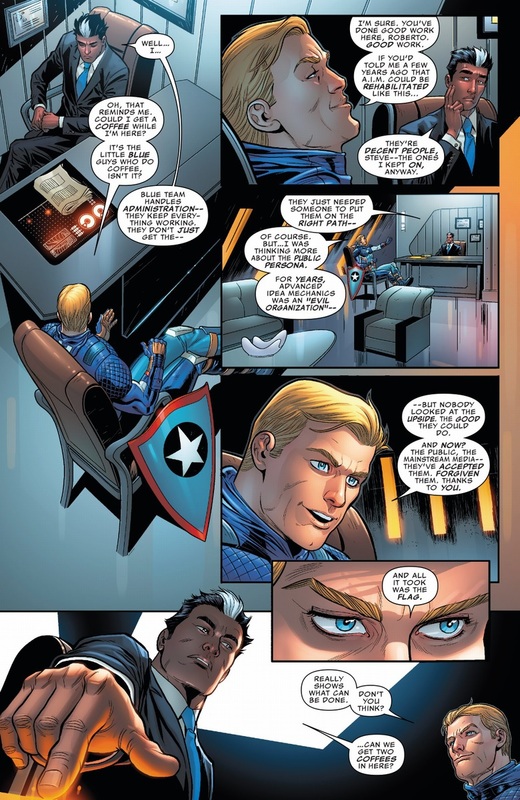 If I did most of the talking... that means he did most of the listening"
I'll be interested to see how this plays out, which is a lot more than I can say about most of this Secret Empire stuff. when did Roberto become like... a master chess player? he's approaching Ozymandias levels of prep here. Various creators have said that Marvel doesn't force books to tie into events, and when they do tie in its because the creative team chooses to. Now, Ewing is the undisputed master of the event tie-in. He makes the event work *for* his book instead of the other way around, and he somehow finds a way to work them seamlessly into the ongoing narrative already established. But I wonder why he keeps doing them. Is it that he genuinely enjoys it, or do they actually improve sales? This is just a guess, but I think its because Ewing's aesthetic is the same as mine when it comes to comics. Comics are a shared universe with a shared history. The joy of reading a comic is the balancing act they have to do between taking everything else into account and making sure readers who have never read anything else but the comic in front of them aren't lost. Reading a Ewing comic is such a joy in large part because he almost never skips an event or ignores history. Hell at this point I think it make might his signature as a comic writer. Maybe he's doing it as practice. 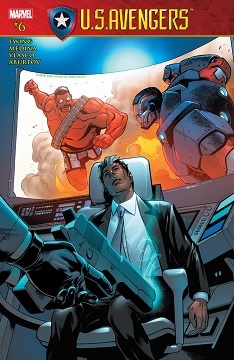 It's clear as his assignments for Marvel grow that Ewing is on the shortlist for writing a major event in the future, and thus writing tie ins give him an opportunity to see how the mechanics of crossovers work. Ewing doing an event would be magnificent. I have my doubts about the whole "doesn't force books to tie into events" thing. It sounds like a PR line. Or at least a "Sure you don't have to tie in but if you don't, we'll find a writer who will tie them in and you can take a break for a month or two." I don't know how anyone could have that conversation with Cap and not think from the second or third sentence in, "there is something deeply wrong with him right now." 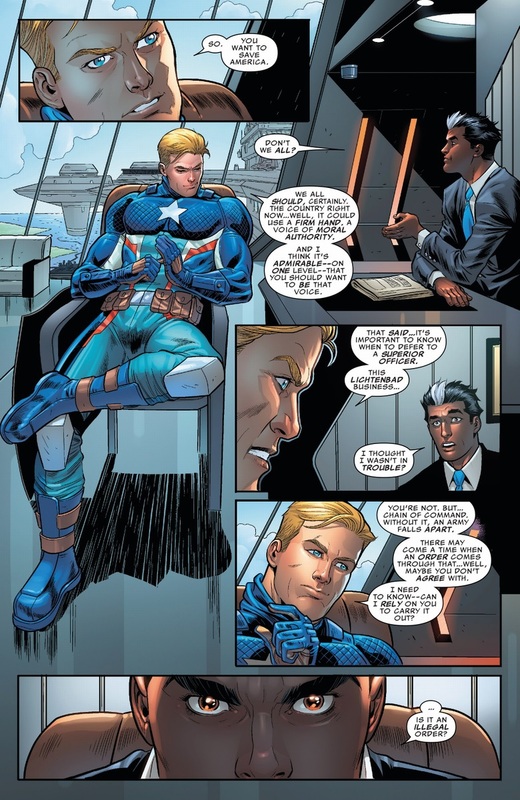 Even characters who were never in the Avengers have to think "Cap usually isn't like this, no matter how serious." 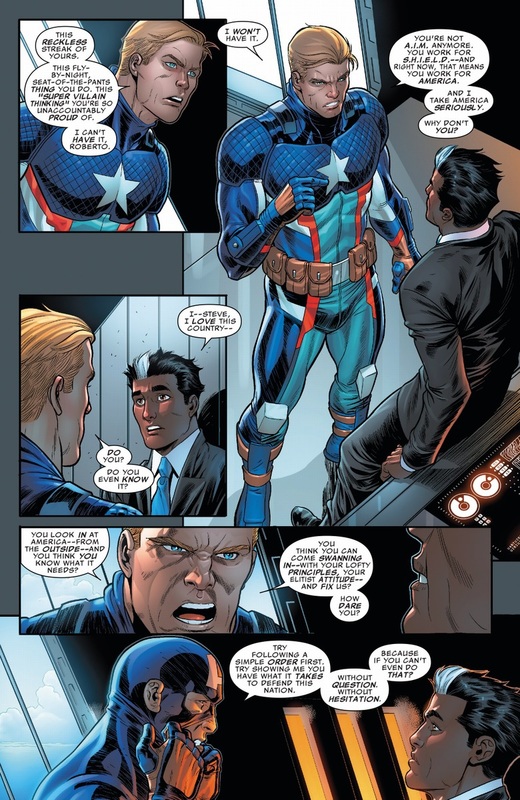 Roberto looks suspicious of Cap's motives in a few panels. This is what I'm sayin'. I mean, it's Cap. 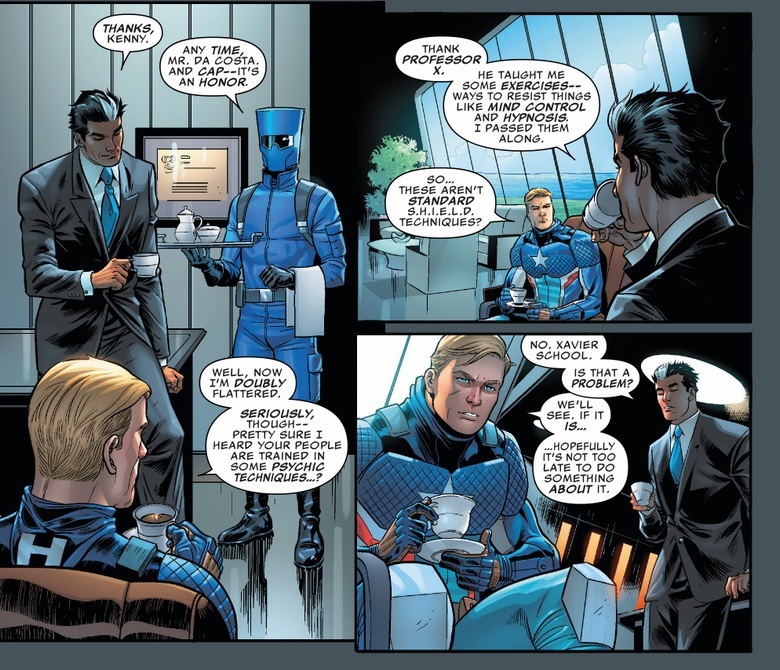 It's Cap, and he's sneering dismissively about the administrative specialists being "the guys who get the coffee"? That's a big flashing neon sign that says "something is wrong with me, I'm really not myself." But the reason this works for me is that Roberto is not in a position to say that for sure. Someone like Tony would've subjected him to an EM scan after the "all it took was the flag" bit. But Roberto doesn't have that history with Steve. 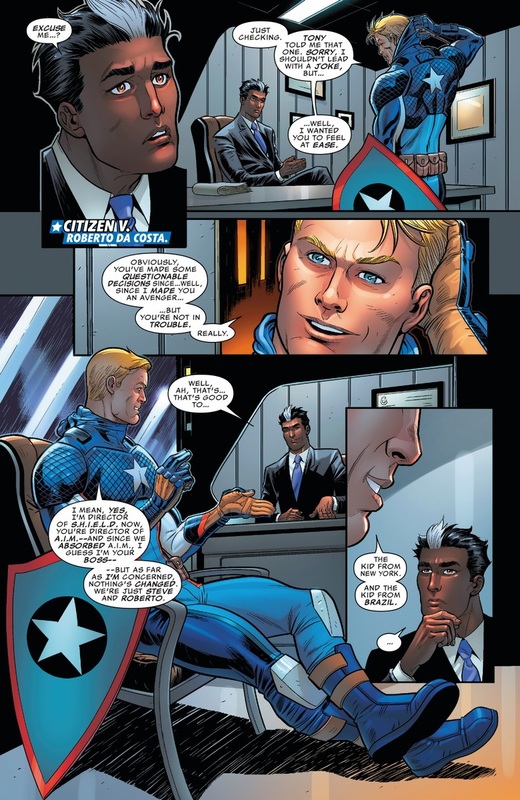 He knows about Cap's public persona, everyone does, but this is the first time they've met in the kind of behind-closed-doors meeting you have with your boss. In his right mind, Steve's a WYSIWYG kind of guy. He's not someone with a well-loved public persona and unquestioned authority who abuses that and is a terror to work with in private. But if he were, he wouldn't be the first, you know? Oh, it works for me, too. This reads, for me, as two very intelligent people locked in high-stakes, low-key social combat, and I rarely get to read two smart characters who are both being written as smart in the same situation. Roberto doesn't know Steve that intimately though. 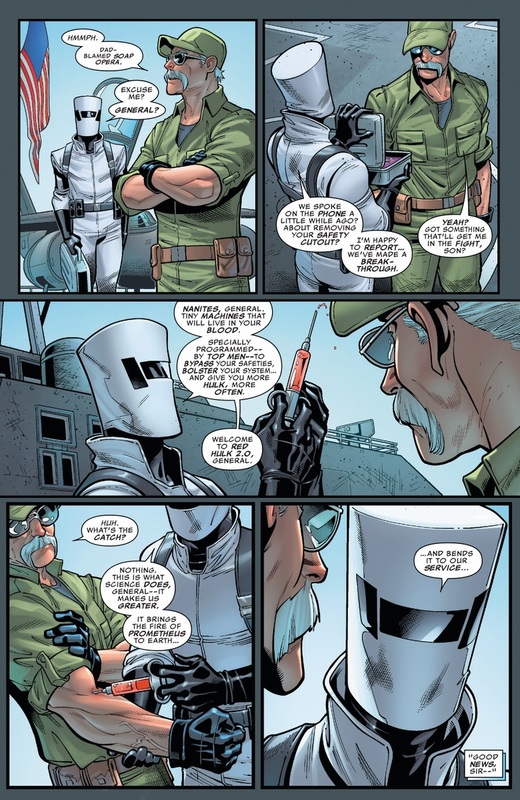 No mention of how Roberto was also trained by Magneto and Cable? Heck, he was recruited by Xavier when Xavier was infested with a Brood Queen who was trying to find new mutants hosts for it's young, AND who has been in charge of oversight of the ruddy Hellfire Club. 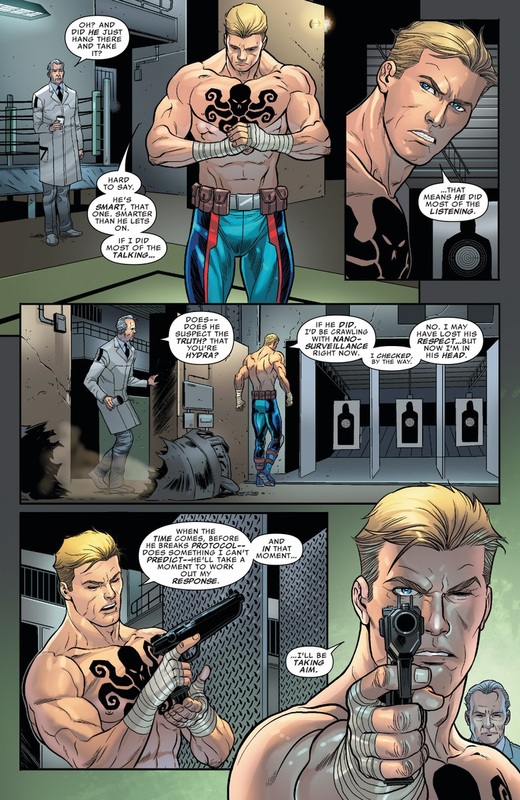 I feel like Hydra-Cap would be paranoid enough to test everything he eats/drinks, for fear of poison. 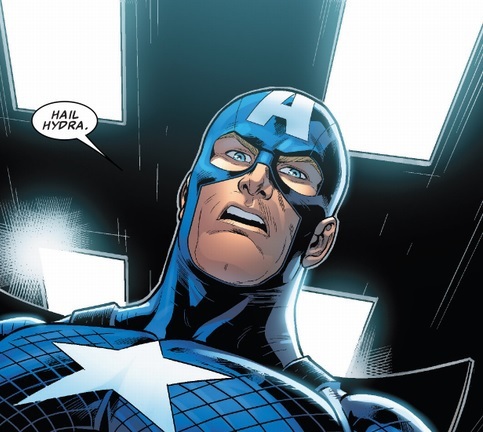 Now, bugging his employees and facilities in case someone, for whatever reason, happened to say "Hail Hydra" out loud, seems like would be a good move. Especially considering the history of many of the employees. Yeah, I'm ready for Roberto to reveal next issue or whenever that he's still one step ahead of whatever is going on. You know, an agent of AIM actually being an agent of Hydra has got to be the least surprising revelation ever. I'm calling at least one more twist on that guy's loyalty before all is said and done. Triple agent working for Damage Control. He's actually working for Amanda Waller. One multiverse wasn't big enough for her to control. Wait, didn't Doc Green try to cure all the other Hulks? 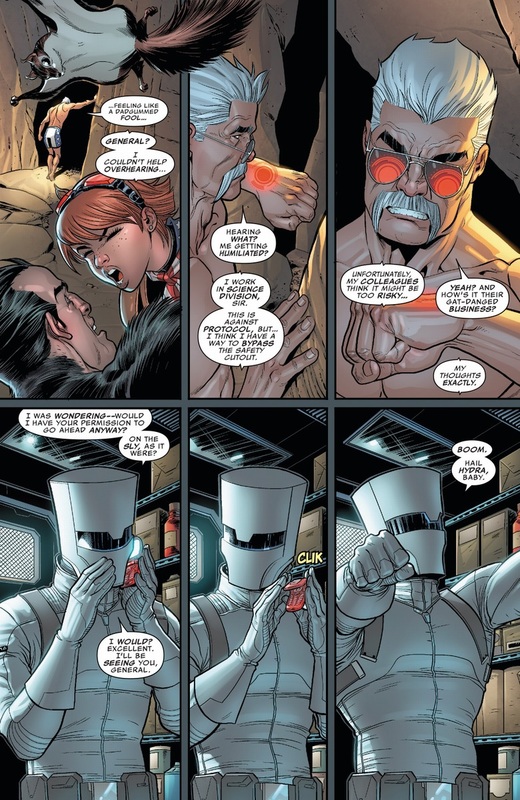 How did Thunderbolt Ross get his powers back? 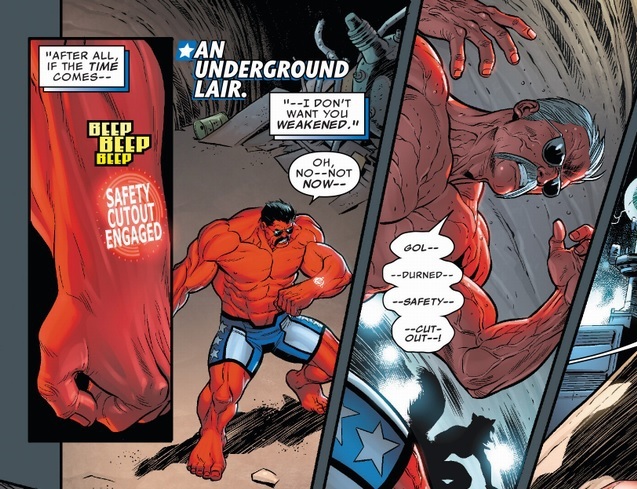 If you asking how this Red Hulk came to be: Secret SHIELD experiments into Gamma enhancements (Hulkish powers). That's not Ross, that's General Maverick. Besides, gamma cures rarely last forever.